If you are busy planning your next trip to Disneyland, sometimes one of the biggest decisions can be where to stay. 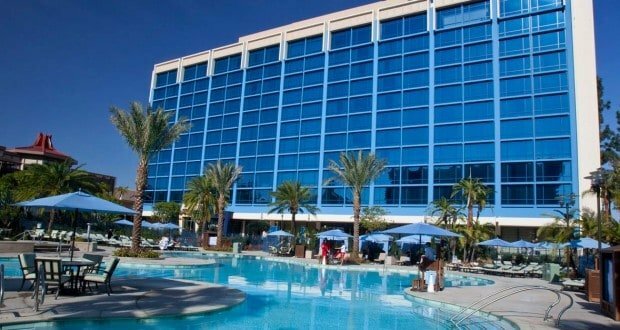 While there is plenty of off-site hotels to pick from, there is some benefits and extra Disney “magic” that you can only get at one of the 3 on site properties. Here is our list of the top 10 best things about staying at Disney’s Paradise Pier, Disneyland Hotel or Disney’s Grand Californian Hotel and Spa. 10. Can you say shampoo? – That’s right, shampoo and soaps are one of the things we love about staying on site. They come in the cutest bottles and wrappers and smell wonderful. I won’t lie, I do in fact hide them before housekeeping comes just to make sure I can get more. I bring them home to use whenever I need a little Disney in my life but can’t get to California. 9. Character Wake Up Calls – If you have to wake up at sunrise to catch the extra magic hour, why not let it be Goofy to get you out of bed? When you check in, you can set up character wake-up calls from your hotel room. You select the character and the date and time for the call. No matter how tired you are, there is something fun about hearing your favorite character on the phone telling you to get up and get to Disney. 8. Views, views, views! – There are some rooms at each hotel that can offer a view that is picture perfect. Depending on what your preference is, you can watch the World of Color show from your bed with the music piped in through the TV. You can also have views of Downtown Disney and all the nightlife that keeps that street entertaining. You also can get views of some of the nightly fireworks shows. The Paradise Pier Hotel even has a pool deck open nightly to watch the shows with music coming through the speakers. There is something to be said about watching these amazing shows and then not having to fight a crowd when it’s over. 7. Rest and Relaxation – Besides the go, go, go of a Disney vacation, Disney also knows how to help you relax. The Mandara Spa at the Grand Californian Hotel is built with just that in mind. Not only do they offer all the standard spa treatments done only the way Disney can do, they also offer some unique fitness classes. They have yoga on the grounds of the hotel set in a tranquil Redwood forest setting and if you are an early riser, they have a morning walk through California Adventure before the park opens. It really is serene to see how beautiful and detailed the park is when it’s empty. 6. I can’t tell a lie, Pinocchio’s Workshop is great – Since Disney takes care of kids’ fun, they also help take care of adults too. All on-site guests have the option to take their children to Pinocchio’s Workshop, a supervised child center where the kids can have some fun and the parents can cut loose at some of the fabulous Disney dining and lounge options. 5. I’ll drink to that – Speaking of lounges, the on-site hotels have some great places to have a drink. The Surfside Lounge in the Paradise Pier Hotel, Trader Sam’s Enchanted Tiki Bar and Hearthstone Lounge all have great themed décor and drink menus to match. If there is too many choices, the bartenders and wait staff are very knowledgeable and are always willing to help you out. 4. Let’s make a splash – If you are taking a mid-day break, like we do on every trip, make sure you do it at the resort pools. They are all amazing. The pools at the resorts all have slides that keep the little ones, and some big ones, busy for hours. As a guest, you can pool hop and enjoy them all. In the summer, they have pool parties with games and music. At night, they have movies poolside. Even if it is a movie we have seen a million times, (Frozen, anyone?) watching it at a pool at Disney makes it even better. 3. Sometimes less is more – I know I have said it before, but we love the size of Disneyland and this is one of the reasons why. All 3 of the on-site Disney hotels are within walking distance of each other, the 2 parks and Downtown Disney. You don’t need to move the car or get a cab to get to any resort area restaurant or park. While other hotels seems close, once you have to walk to the common entrance or park your car, you find you have easily walked over a mile and you haven’t even made it to one attraction. 2. Characters and food?! Sign me up. – All 3 hotels offer character dining experiences. We have done many of these at Walt Disney World, and love them all, but at Disneyland we have found that you usually get many more characters at each seating, characters you don’t normally see, and the dining rooms are not as huge. We eat at these almost every time we visit. Goofy’s Kitchen at Disneyland Hotel, Storyteller’s Café at The Grand Californian and PCH Grill at Paradise Pier all have a buffet breakfast and Goofy’s Kitchen offers a dinner buffet also. Make sure to book one of these on your next visit. 1. Shhh…can you keep a secret? – Our favorite thing about staying on property is the secret entrance into California Adventure Park. It’s tucked away in the Grand Californian hotel and any on site hotel guest can access it as long as you have a park admission ticket. We always use this entrance to bypass the long lines usually found at the main gate. There is also an entrance to Downtown Disney from the other side of the hotel without having to go around to the main entrance. There are so many more reasons to stay on site at Disneyland, this is just a few of our favorites. The Disney details and magic are not just in the parks, but where you put your feet up when not pounding the Disneyland pavement.